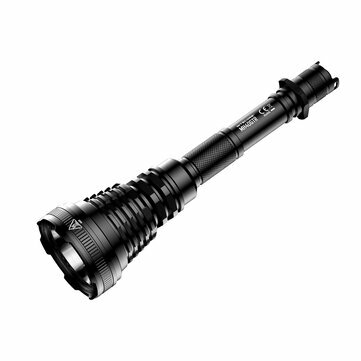 - Ultilizes a XP-L HI V3 LED, with a maximum output of 1200 lumens. - Maximum peak beam intensity of 252000 cd and maximum throw of 1004 meters. - Intelligent charging circuit with voltage detection charges safely and rapidly. - High efficiency constant circuit provides stable output up to 140 hours. - Onboard charging port sleeve protects the port from dust and water ingrssion. - Four easily accessible brightness levels. - User defined mode allow for quick access to the setting last used. - Intelligent memory function stores preferred brightness settings. - Broad voltage circuit accepts both rechargeable and non-rechargeable Lithium batteries. - Electronic reverse polarity protection. - Toughened ultra-clear mineral glass with anti-reflective coating. - Constructed from aero grade aluminum alloy. - HA Ⅲ military grade hard-anodized finish. - Stainless steel titanium-plated clip.